Perfectly located in the heart of the National Park, this delightful holiday cottage (one of a pair) is peacefully situated on the lakeshore road, only yards from Esthwaite Water (fishing available), and less than a mile from Hill Top, home of Beatrix Potter and the famous Tower Bank Arms. Beautifully appointed in chic, contemporary style, the property retains its cosy cottage features. The front garden faces the lake, which has excellent views in winter, whilst the large rear garden backs onto woodland. Quintessentially English, this lovely area is steeped in history, and there are delightful walks direct from the doorstep. Hawkshead, Windermere, Grizedale Forest, Ambleside and Grasmere are local places of interest. 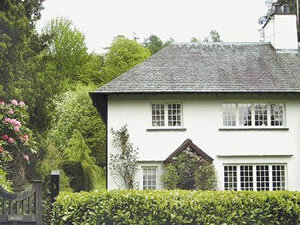 Dove Cottage - the home of Wordsworth - is open to the public all year. Shops ¾ mile. Step to entrance. Beamed living room with open fire. Garden/dining room with delightful garden view. Modern well-equipped kitchen. Utility/boot room. Double bedroom with step up to en-suite shower room and toilet. Small step down to separate toilet. First floor: Two double bedrooms, one with 5ft bed. Twin bedroom. Feature cast iron fireplaces in all bedrooms. Bathroom with over-bath shower and toilet. Broomriggs Cottage is in or near Hawkshead in Cumbria, North West England.